The BS7609 code is a British Standard which sets out what is best practice for the installation and inspection of uninsulated compression and mechanical connectors for power cables with copper or aluminium conductors – this effectively ensures the compliance with recommended workmanship when crimping cables using cable lugs to avoid built-in points of future failure in cable joints, terminations and electrical connectors at LV MV HV. 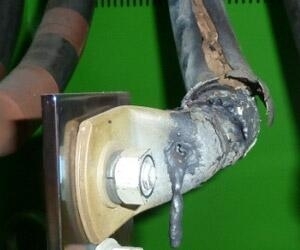 Incorrectly installed or crimped cable lugs can lead to “hot-spots” and the dangerous burning out of electrical cables causing devastating power failures and in worst cases fire. Under-crimped cable lugs installed with uncalibrated crimping tools will lead to loose electrical connections triggering a disastrous domino effect: resistance restricts the ability of the current to flow effectively and consistently through the electric cable. Thermal build-up in cable systems due to poor workmanship or poor quality cable lugs will inevitably cause cable joint or termination failure. This problem is prevalent and amplified where cable systems and lug terminations are subject to high levels of in-rush current for standby power generation systems. Observance of BS7609 by electrical engineers, cable jointers and substation workers safeguards the reputation of the installer, their company and the manufacturer of the cable lugs or connectors – in this post we are working with Cembre the leading Italian based and one of the largest European manufacturers of electrical compression connectors, cable lugs and related crimping tools. 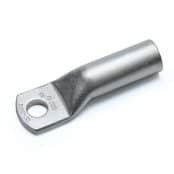 Crimping is the method of attaching the metal terminal or cable lug (typically copper or aluminium) around an electrical conductor to provide an excellent electrical connection. 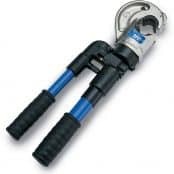 Using the correct tool such as a Cembre cable crimping tool the cable lug is effectively bonded or compressed to the electrical conductor of the cable using high compression forces generated by the crimping tool. 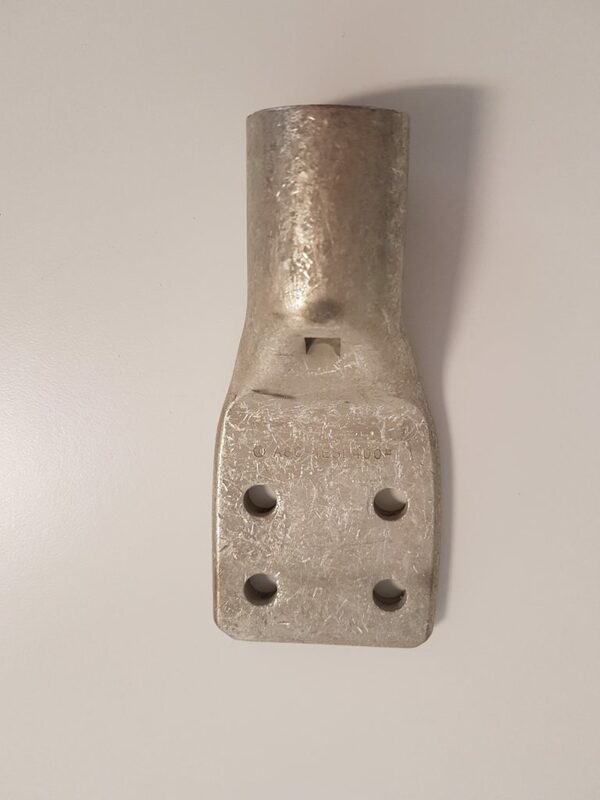 Cable lugs are often over-looked in the specification and performance of LV HV electrical distribution systems, however under-specified or incorrectly installed cable lugs are major contributors to switchgear failures and power outages. 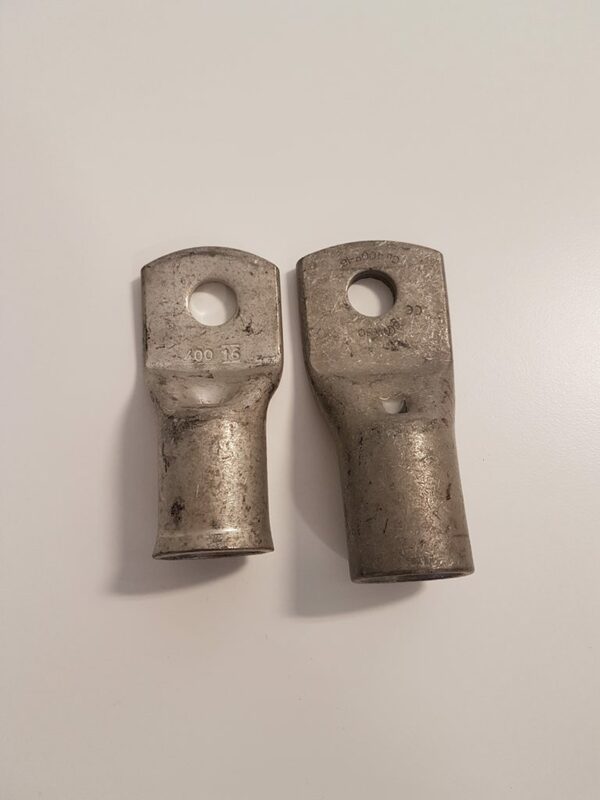 Although arguably the lowest cost component of a cable installation, whether LV, 11kV or 33kV, the actual cost of cable lug failure in terms of loss of power and reputation is immeasurable. Failure to observe these precautions can result in a compression connector, cable lug, cable joint or termination that fails in service. Choose a manufacturer providing crimp tooling, die set and crimp lugs matched to work together to give assured crimping performance. Avoid “cross-crimping” where a “dolly mixture” approach to the choice of lugs, tools and dies introduces a cocktail of often incompatible different manufacturers into the crimping process. Achieve a systemised approach i.e. crimp lugs + crimp tools + crimp dies = 1 brand. Each crimp lug should be marked with a reference on the barrel or palm – this shows that the cable lug selected is the correct size and type for the conductor. Refer to the die selector to select correct Cembre dies. Prepare the conductor by stripping the insulation back. The strip length should be equal to that of the cable lug barrel. Take care to avoid damaging the conductor strands – exposed cable strands should be cleaned to remove any remaining insulation from the LV MV HV cables. Fully insert the conductor into the barrel of the cable lug – check the cable conductor is fully inserted using the inspection hole provided. Using the manufacturers instructions, crimp the cable lug – paying careful attention to the positioning of the crimp die on the barrel of the lug. If multiple compressions are required pay attention to the sequence in which they are made. Marking on the cable lug shows it is correct for the conductor type and size. The marking on the cable lug shows the correct crimping die set was used. No insulation is trapped in the cable lug barrel. Excess grease is removed from insulation and cable lug. If an inspection hole is provided, the conductor has been fully inserted. It is not over-compressed or under-compressed. Both of these can have a detrimental effect on the performance of the joint.Incorrect compression can cause excessive flash or burrs. If in any doubt, samples should be produced for test purposes. Cembre supports the Approved Cables Initiative (ACI) Code of Practice to ensure that the conductor used is both third-party approved and appropriately marked. The cable lug should have an equal current carrying capacity to that of the conductor. Copper tube lugs designed and manufactured by Cembre achieve maximum electrical conductivity with minimum resistance by the use of high purity, electrolytic copper having a cross sectional area equivalent to that of the conductor. Beware cable lugs are manufactured from thin wall copper tube as they have the potential to cause elevated temperatures when the conductor is carrying high levels of current. Recommended procedures for conductor preparation and crimping Cembre copper tube lugs, including number, position and sequence where multiple compressions are required. Cembre copper tube lugs are also fully annealed after pressing to alleviate residual stresses within the palm area and ensure optimum mechanical and electrical performance at the connection interface. 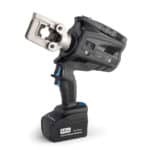 Ensure Cembre crimp tooling is certified as calibrated regularly and serviced correctly and all equipment, particularly die sets, is inspected for damage or wear and maintained in good condition. ALWAYS refer to the Cembre die selection chart. A die selection guide booklet is also included with every new Cembre crimp tool, whether hydraulic crimping tools or battery crimping tools. The number and sequence of compressions shown in the die selection guides are specifically determined for Cembre lugs from the lug type and design, the force applied by Cembre crimp tooling and the bite width of the matched die set. ALWAYS apply the correct number of compressions as per the die selection guide in order to assure the performance of the joint after cable crimping. Apply each compression in the correct sequence to avoid distorting the cable lug. Which Cable lug & die combination to use when crimping extra flexible conductors? Cembre copper tube lugs for extra flexible conductors 35sqmm to 185sqmm have the same cross sectional area of copper as standard Cembre A-M lugs for LV applications, but with a slightly wider inner diameter to more easily accommodate the fine strands. Above 185sqmm it may not be possible to use the correct size standard lug with an extra flexible conductor. For example, say a 240sqmm lug does not fit on a 240sqmm extra flexible conductor, it is acceptable and common practice to use the next larger size of lug, here 300sqmm. 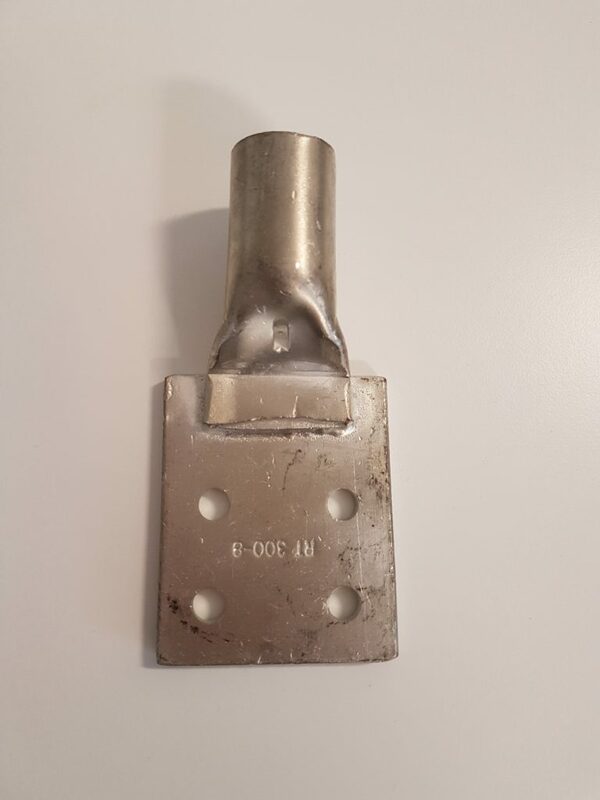 The lug MUST however be crimped with the die set appropriate to its size, 300sqmm, since using a 240sqmm die set will distort the cable lug and be detrimental to performance. Which Cable lug & die combination to use when crimping compacted conductors? 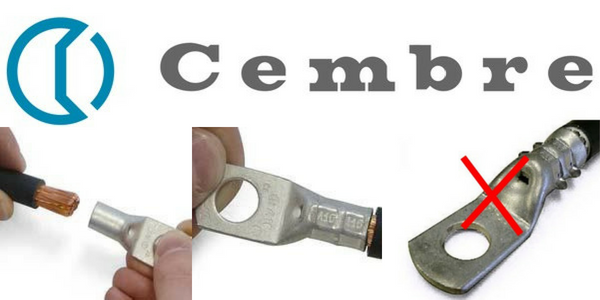 For low voltage applications use Cembre A-M Copper tube lugs. Matched crimp tooling and hexagonal die sets MUST be used. Always apply the rule that the cross sectional area of the lug should at least equal that of the conductor so, when using compacted conductor it is essential that the correct size lug be used, even if the fit appears ‘loose’ prior to crimping. The apparent ‘loose’ fit is due to the air between conductor strands having been ‘compacted out’ during manufacture, causing a slight reduction in the diameter of the conductor. The resulting gap between conductor and cable lug barrel wall is fully taken up during the crimping process. Do not be tempted to move down a lug size to obtain a tighter fit, as there will then be insufficient copper in the shoulder or palm of the cable lug. As an example, for 185sqmm compacted conductor use A37 lug, ME37-C die set and appropriate Cembre crimping tool. T&D are Main UK Stockists for the Cembre range of compression connectors (cable crimp lugs and splices) for all low and high voltage crimping applications of power, control and instrumentation cables with either copper or aluminium conductors. Cembre copper, aluminium and bimetallic cable lugs and splices are designed for high voltage cable crimping applications including 3.3kV, 6.6kV, 11kV and up to 33kV. Cembre 2A HV cable lugs and splices are made from high purity copper, annealed and tin plated with extended barrels for reliable high voltage electrical connections. 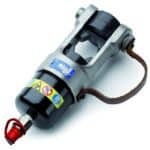 Cembre electrical connectors are the market leading crimping system for reliability, consistency and peace of mind performance – specify Cembre to crimp, splice and terminate your vital high voltage electrical circuits. Both of the below copper cable lugs in picture 1 are specified by their respective manufacturers to crimp and terminate 400sqmm stranded copper cables – pictured right is the Cembre cable lug, note the CE Marking. CE marked cable lugs guarantee product compliance with EU safety, health and environmental requirements. Clearly the Cembre lug has increased barrel length and a thicker cable lug wall for an advanced standard of electrical connection with excellent conductivity due to high copper content – the thinner wall cable lug pictured alongside which is a imported and unbranded product is lighter weight and dimensionally smaller than Cembre brand lugs. When terminating either armoured, unarmoured or braided cable types we recommend only to use branded type cable terminations such as Prysmian cable glands. Quality – Cembre crimp lugs and splices are manufactured from electrolytic copper tube – the copper tube dimensions are designed to obtain the most efficient conductivity and mechanical strength to resist vibration and pull out. This includes electrical connectors for LV 600/1000V and MV HV cables operating at 11kV/33kV. Strength – Cembre cable lugs are annealed to guarantee optimum ductility which is an absolute necessity for crimp connectors which must withstand the severe deformation arising when compressed by hydraulic crimp tools. In electrical installations subject to vibration, crimp terminals must perform a reliable connection – annealing avoids cracking or breaks between the cable lug palm and barrel. This applies especially to Marine & Shipboard cables in offshore installations subject to high levels of movement and mechanical stress. Reliability – Cembre cable lugs feature an extended barrel design facilitating full insertion of the the copper conductor into the crimp lug – the cable lug barrel length has been designed to allow easy and accurate positioning of the dies during the crimping operation. Note the distinctive quality differentials between the Cembre brand transformer lugs and unknown, unbranded type. 1. Cable Lugs – Low Voltage Single Hole 400sqmm. T&D are Specialist Distributors of an extensive range of LV, MV & HV Jointing, Earthing, Substation & Electrical Eqpt – this includes 11kV/33kV/66kV cable joints, terminations and connectors for both UK DNO, private network applications and international cable specification and standards. Contact our UK Power Team for competitive quotations, fast delivery from stock and technical support or training on all LV-HV products.